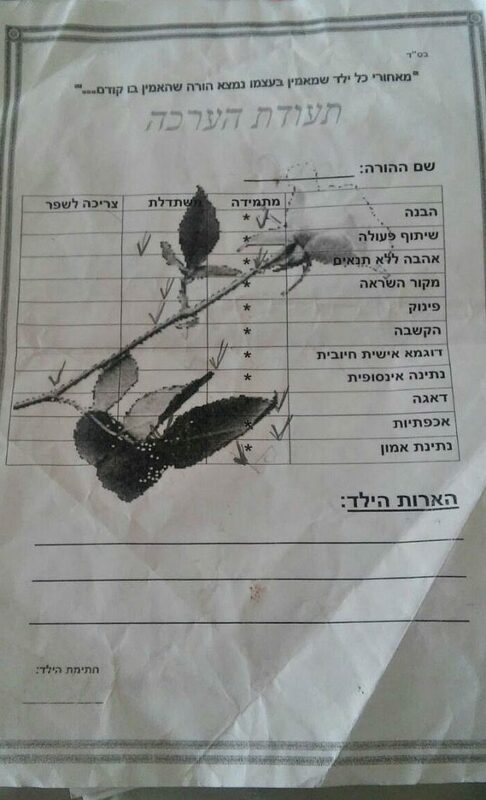 This week, an Israeli teacher decided that every child in her class would give a report card to his or her mother. And one horrified mother posted the so-so report card her child gave her. Yesterday I injured my right index finger, which means that there’s some things I can’t do for the next while. So this morning, before she left for school, I asked my 11-year-old daughter, Moriah, to tie my running shoes for me. And as she tied them, I felt such gratitude to her. This was something I couldn’t do, and she did it for me. If not for her help, how would I even have gone outside today? And this reminded me of all the thousands of times I have put shoes on my children. And dressed them and changed their diapers and fed them and took them back and forth to gan and took them to doctors appointments in addition to the myriad of other things I have done and continue to do to take care of them. I also gave birth my children. Hashem, my husband, and I gave them LIFE. If not for me, they would not even BE HERE. Every mother, myself included, has faults and weaknesses and things that need improvement, but in almost all cases a mother’s weaknesses are a drop in the ocean compared to the giving and caring and nurturing we do for our children. Maybe that’s why Hashem made honoring one’s parents one of the 10 commandments. *A commenter on facebook made a good point– she noticed that the original report card has all stars in the “always” column. The teacher, it seems, meant for this to be a report card with all As! But individual children gave other grades instead. I don’t know if it was just this one child or the whole class or whether the teacher told them to choose their own grades…But it seems like a good possibility that this wasn’t the teacher’s intention– which is a relief! This is shocking! I am surprised that teachers would train children to scrutinize and criticize their parents like that. It isn;t good for anyone involved, including the children. 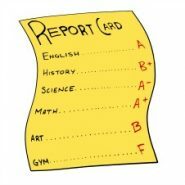 a commenter on facebook made a good point– she noticed that the original report card has all stars in the “always” column. The teacher, it seems, meant for this to be a report card with all As! but individual children gave other grades instead. Don’t know if it was just this kid or the whole class or whether the teacher told them to choose their own grades…But seems like a good possibility that this wasn’t the teacher’s intention– which is a relief! Maybe you should take this post down? And contact the teacher directly? It does seem that the original has been tampered with, and it may not be in the final form (always level) that the teacher intended. I am trying to reach my friend who received this from the mother on an Israeli whatsapp group– to see if the facebook commenter’s interpretation was correct. In any case I think that the post makes an important point–whether the person who initiated the report card for mothers was, in fact, the teacher or the student. But I am going to try to clarify…In the meantime I have edited the post to note the lack of clarity around the teacher’s intention. I actually think this is a realistic comment – look what the child is saying: my mother is always understanding, always loves me unconditionally, always a positive role model, always concerned and caring and always believes in me! Sounds like she’s doing a good job of getting the core message over. The fact that sometimes the mother is busy and can’t listen fully is just truthful for many people. If she doesn’t always spoil the child, give them everything they want and let them do whatever they want (which is how I’m interpreting ‘sometimes co-operative’ and sometimes ‘infinite giving’) means that the parent is doing a good job in those fields as well – giving a child exactly what they want all the time whether it’s permission to do something or a physical object is not usually good parenting. So whilst I agree it’s maybe not the best activity the teacher did, I don’t think it’s terrible. Looking at it closely again, it does look very much like the teacher intended to give ‘always’ grades for everything and the child just to put a thank you message on the bottom…particularly with the rose across it – it’s meant to be a sort of Mother’s Day card, I think.